Dschinghis Khan (also known in some countries as Genghis Khan) are the German pop sensation known for their self-titled 1979 entry to the Eurovision song contest and their 2018 FIFA World Cup anthem ‘Moskau’. The group’s original line-up was brought together in the late 70’s by producer Ralph Siegel to represent Germany at the 1979 Eurovision: their catchy track ‘Dschinghis Khan’ earned them a respectable 4th place and became a huge hit, leading to a mainstream breakthrough and a successful career. Known for their extravagant clothing and flamboyant image, Dschinghis Khan released historically-themed hits such as ‘Hadschi Halef Omar’, ‘Himalaja’ and ‘Mexico’, riding the disco-pop wave that dominated the charts during the late 70’s and early 80’s and finding considerable success in Europe, Russia, Israel, Australia, and Japan. Their biggest-selling single was the 1979 smash hit ‘Moskau’, which topped the charts in Australia for six weeks thanks to it’s prominent use on TV coverage of the 1980 Summer Olympics. The group have now reformed, with two members of the original band still remaining (Edina Pop and Henriette Strobel) and four new performers completing the line-up. 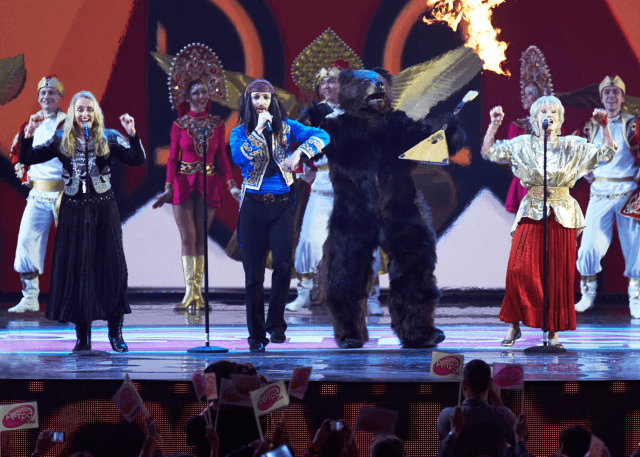 A reimagining of their iconic hit single ‘Moskau’ was recorded in 2018 and used as Russia’s 2018 FIFA World Cup anthem, putting this extravagant bunch back on the musical map once again.